Turn your patio or deck into an outdoor living space with help from the Achla Wooden Hennell Bench. The classic, square frame and hardwood construction of this piece add a timeless hint to your garden, while its detailed backrest lends striking artwork. Curved slats span this entire section, creating interlocking diamond and oval shapes for an elegant look. These accents evoke the fretwork of Hennell silver salt cellars made in the 18th century, bringing a time-tested hint to your backyard. A 47" long and 15" wide, slatted seat extends from this decorative backrest, forming a comfortable resting spot. These slats all dip slightly downward in the center for a great seat, and the two included side panels with arm rests and affixed legs complete the unit. The brown hue throughout this item meshes with your outdoor setting perfectly, and its hardwood construction will withstand seasons of use. The legs rest on a level surface, and the piece assembles quickly with its included hardware. 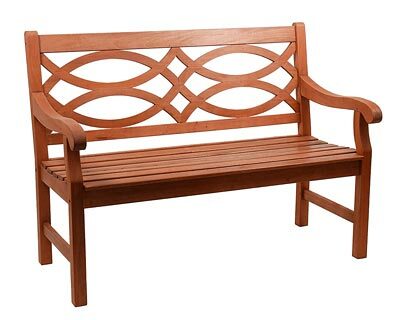 Bring remarkable seating to your yard with this Wooden Hennell Bench. Assembly required.